Have you heard the one about the meat inspector and the non-breeding golden-headed cisticola. Sounds catchy but there is no punchline. 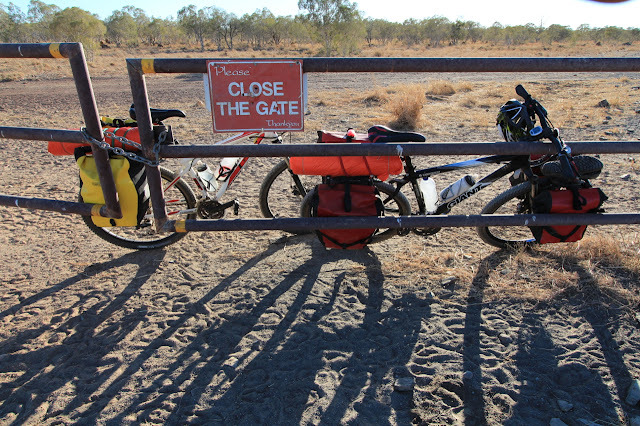 They are just two snippets from an entertaining journey - cycle touring for four days in the Kimberley region of Western Australia. 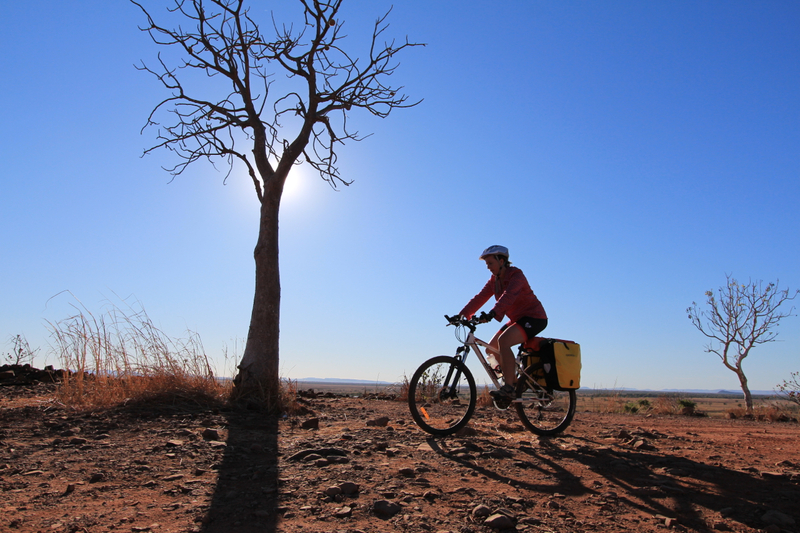 Our first afternoon on this adventure finds us chasing the dense shade of a big boab tree at Maggies Creek Rest Area. 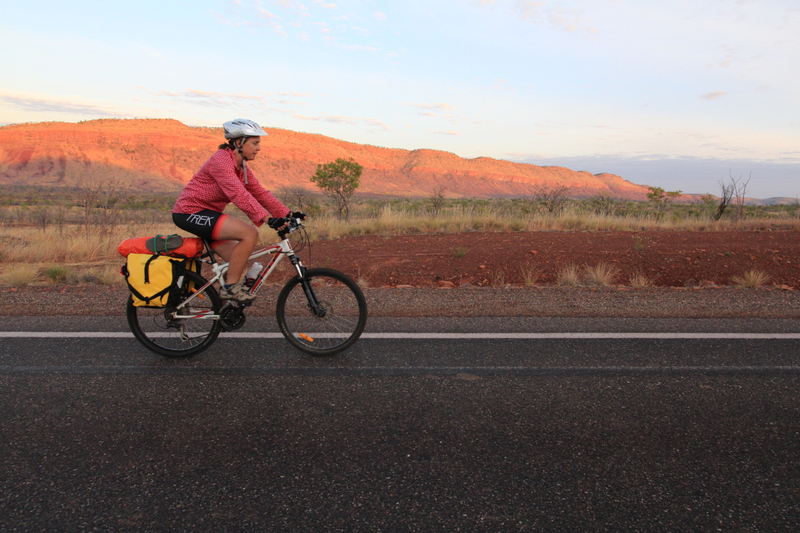 We have stopped for the day, at just 11am, after cycling 77km from Kununurra, north along the main road towards Wyndham. The day is long and hot (34 degrees Celcius). We only move when it is time to shift the tarp. 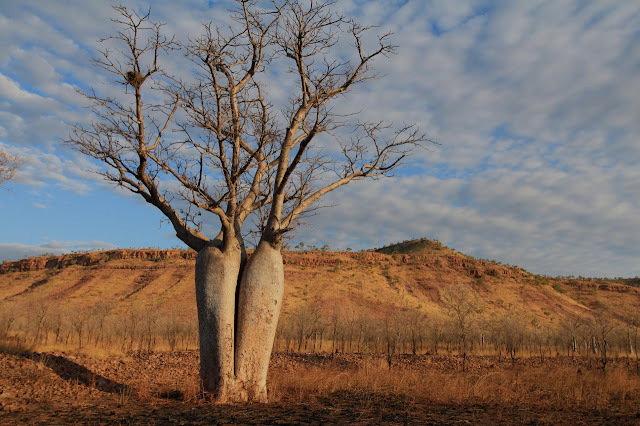 We shuffle everything left and then lie back again, staring up through the boab branches. The afternoon mosey's on – 2pm, then 3pm. We finish early because we start early. This morning we left Kununurra at 6:24am. It is too hot to ride past noon and so slow, restful afternoons will be the norm. At 4pm we are finally joined by a flock of 75 corellas that land in trees above the last scummy pool of stagnant water in Maggies Creek. They don’t say much and don't move much. It seems nothing does in this heat. Eventually they drop, two by two, down to the ground; grubby white and strung along the creek bank feeding for half an hour. Until something sets them off. They flock and wheel. Feathers whisper them east across the hills. For us, the one magic hour is about to begin. It is 4:38pm. 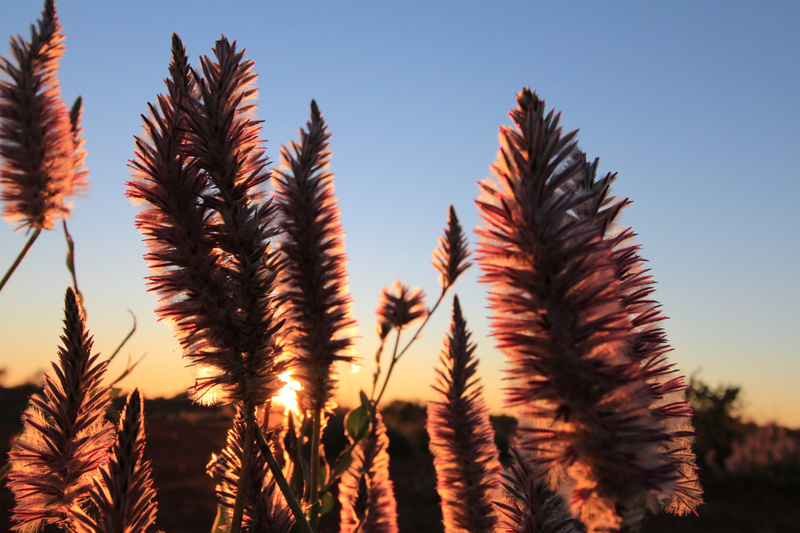 Shadows are long, the sun is almost down and coolness promises itself. My eyes sting from the day of glare and heat on the bitumen. It has been relatively easy riding; no big hills but enough rolling countryside to keep things interesting. The scenery has been spectacular, although mostly distant. Out of Kununurra we could see the rugged, red, bare mountains of the spectacular Carr Boyd Range to the south. Later in the morning, to the west, rose the remote and famous escarpments of the true Kimberley, the Durack and the Pentecost Range and we passed the turn off for the Gibb River Road (a cycle tour adventure still on our to do list). To beat the midday and afternoon heat, our second morning is the same as the first. Up in the dark. By 5:55am we are on the bikes and heading into Wyndham. Two brolgas (graceful, long-legged) watch us nervously as we cycle by. As the sun rises the nearby hills glow warm and red but the air is still delightfully cool, at least for the first half hour. The dry, savannah woodlands are dotted with yellow flowering kapok trees and the occasional clump of tall mulla mullas are flowering by the roadside. Our destination is Five Rivers Lookout, about 6km out of Wyndham and the highest point on the Bastion Range at 360m. 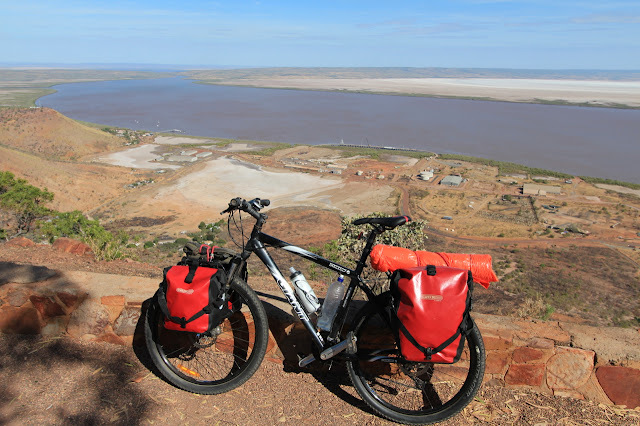 It is a good, hard ride up steep switchbacks and winding climbs but, the views are worth it - the Forrest River, the Durack and Pentecost Rivers, the King and the Ord all snake their way into Joseph Bonaparte Gulf. The expanse of the vast floodplain, of mud and saltbush and mangrove, is truly impressive. We clock up another 20km during the day, just cruising around Wyndham, riding along the jetty and stopping at each of the towns two cafes. We ride past a holding yard full of cattle ready for live export. There used to be an abattoir in Wyndham but this closed down in 1985, according to the ex-alcoholic meat inspector living under a tree in Wyndham Caravan Park. We get chatting to him that afternoon in the camp kitchen. He is a character; generous, well-spoken, full of wild tales and honesty. He tells us about Angry Dave who used to take him fishing. "All Dave kept saying was: "You're using the wrong bait." I didn't know what he meant. Turns out he was pushing the old Bob Hope*. We always wondered why his eyes were like a bloodhounds. The police eventually charged him and he got 5 years so he must have been doing a fair bit of it. We never caught any fish." *Bob Hope is old rhyming slang for dope, or marijuana. There are plenty of adventures to be had up here and at the caravan park we meet another wild story. This guy at the kiosk is waiting for a taxi to take him from Wyndham to Kunurnurra where his Toyota Landcruiser is sitting at the mechanics. He was on a remote, 4WD tagalong Kimberley tour but at the first major river crossing he used his winch to pull another tour member's vehicle out of trouble. The winch burnt out his entire electrical system in the fourby. So, he gets a lift from the tour operator back to Wyndham, hires a barge, loads a tractor onto the barge and motors across the bay, up the river to the river crossing, uses the tractor to haul his car down and then they barge it back to Wyndham where a truck then takes it to Kununurra. The operation costs $3000. Ah, the simplicities of bike travel. 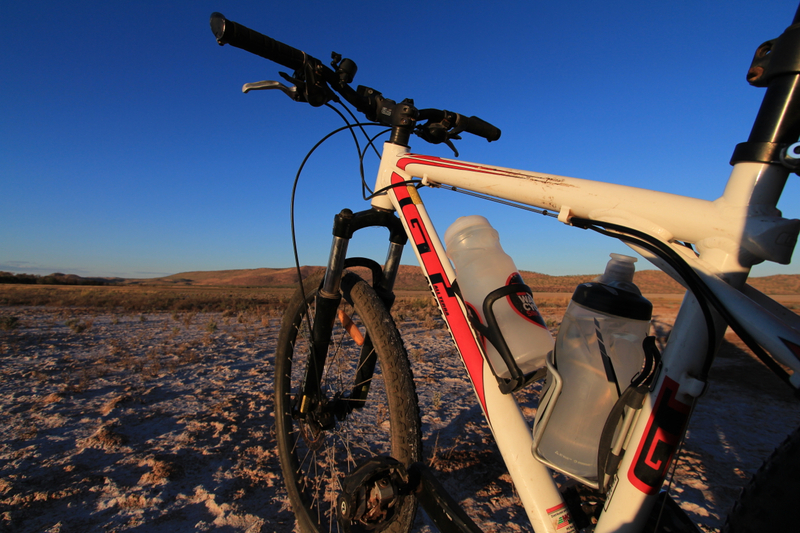 Day three out of Wyndham and the sunrise throws us - as spear point shadows - across salt plains on the edge of town. It is flat riding today and some backtracking, to the turnoff to Parry Creek Road. This begins our dirt-road loop, back towards Kununurra via Marlgu Billabong in the Parry Lagoons Nature Reserve and on to the lower Ord River, following it upstream back to town. The first dirt we hit is laced with sharp rocks and rough corrugations. 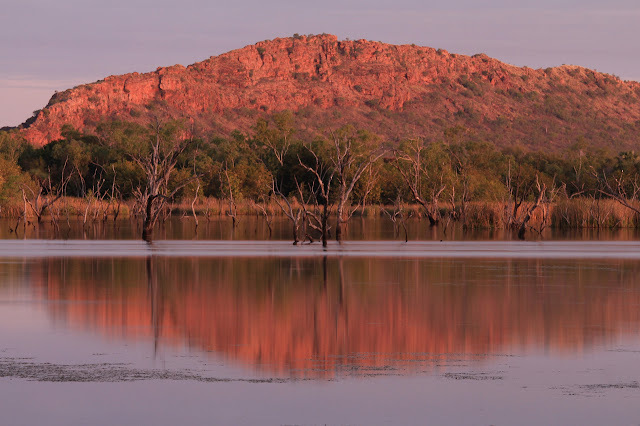 There is one hill, a small rocky rise up to the ruins of an old Telegraph Station, which is now being reclaimed by boab trees. There is little of the old buildings left but as a high point we can see the billabong below, a few 4WDs already in the dusty carpark. There is some serious birdwatching going on when we arrive at Marlgu Billabong. Heads turn as our cleats click-clack noisily along the boardwalk leading out to the bird hide. Half a dozen people are sitting in the hide, or are set up on the boardwalk nearby, with powerful scopes on tripods. 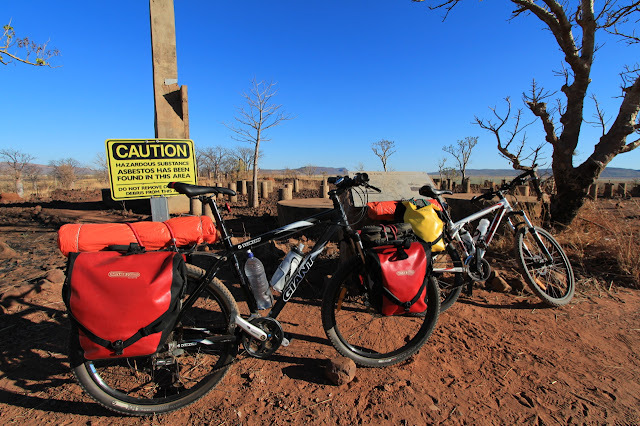 There are thermoses and used tea bags, small backpacks filled with sandwiches, and some serious glass – camera lenses that would be impossible for Caz to consider carrying on a bike tour. One morbidly obese woman is sitting in the bird hide with an equally obese bazooka of a lens resting on the railing. They are all facing westwards. We spot a jabiru, two brolgas, a couple of magpie geese, mostly Rajdah Shellducks, a few pelicans and a white breasted sea eagle. But, it is a tiny little stripey bird, sneaking around in the bushes right under everyone's noses that catches my eye. It is slightly creamy/orange in colour with a long tail and the inquisitive, busy habits of a wren. I point it out to the lady beside us but I get several answers, from several different corners of the bird hide. That's a cisticola, says one. Non-breeding because it hasn't got its golden colour on the head, says another. The lady I have asked suggests it might be a zitting. She is quickly and curtly cut short by another. No, it is definitely a cisticola. And the competitiveness of knowledge, the pride of experience, is as easy to spot as the two large saltwater crocodiles resting on the far bank of the billabong. Then, the crowd settle in again to the silence of a long day of watching the movements of nature and listening to the conversations of birds and the business of beasts in this remote, isolated oasis of lily pads. We tiptoe back to our bikes and watch more brolgas flying overhead. Most of the birders are staying at the nearby Parrys Creek Farm Caravan Park. Not knowing the condition of these back roads we plan to do the same and so cycle off along the rutted track. It is hard-packed, cracked and dried patches of old mud, and a maze of shortcuts leading off left and right through the tall, waving brown grass. From the billabong, this flat floodplain stretches east. It is, we imagine, like riding across Africa's Serengetti plain. Lions and tigers and giraffes, perhaps. The road swings south and re-enters woodland and here it turns to deep sand for a difficult, short section of riding before we reconnect with the main Parry Creek Road. At the intersection, to the right, only 2km away, is the caravan park. To the left, down 35km of unknown dirt road, is the next possible campsite at a boat ramp on the lower Ord River. It is only 9:30am. Seems early to stop. We decide to go for it and tackle the next long stretch of dirt across to the Ord River. It is hot, the sand patches continue. It is dusty and for the first 6km it feels like we have seriously misjudged things. It is, it seems, going to be an epic day. I lag behind, daunted by the tricky conditions. The corrugations are jarring but then I hit a sand patch, soft as a beach dune. Without enough strength to push through, my front wheel loses its line and kicks sharply to the left. It is easier to jump of and push for a few metres then jump back on again. As I struggle with the mental and physical challenge of what lies ahead I make some comment about how we could be lying around the pool at the Parry Creek Caravan Park talking to birders about cisticolas etcetera. Caz comes back at me with the big call, asking firmly, "Are you 100% committed." "I am, I am," I reply in a panic. "I'm committed." The serious tone to his call makes us laugh, but I see his point. If I am 100% committed then I need to work just as hard. And so our focus turns back to the road, and, as if rewarding us for this new found focus, we come across evidence of the Kimberley travellers most beloved friend – the grader has been through! After the first difficult 6km, the dirt is now remarkably easier to ride and we learn to follow the smooth, hard gutter left by the outer edge of the grader blade. We make good progress and ahead, at the end of another long, long straight stretch of road, are big trees, much more densely grouped than the savannah country either side of us. So, the river must be close. It isn’t. It is like a false summit when climbing a mountain. That line of good trees seems to remain forever in the distance. We seem to never get there. Metal telegraph poles stretch away in another stright line, kilometres of them disappearing into the distance ahead. 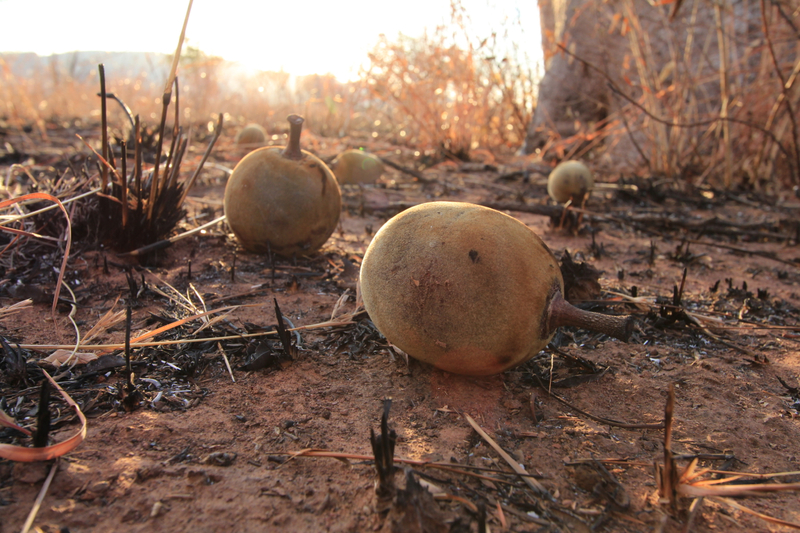 The Kimberley in the dry season has a distinct smell of straw and dust. The dried remains of tall Mitchell Grass and the grey powdery ground are mixed by the daily trampings of top end cattle. We eat our lunch in the dust, stopping for a rest by a cattle grid with a motley herd of boney, sleek-skinned, floppy eared beasts watching from a stand of trees nearby. 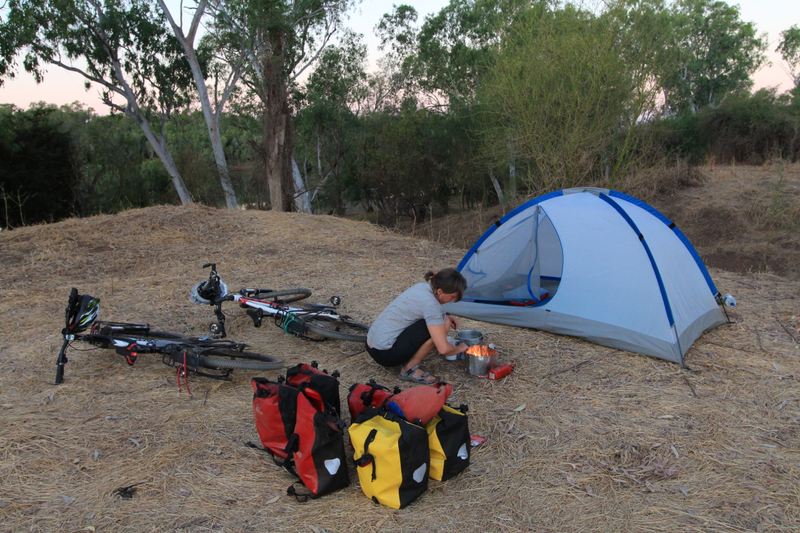 This is how we do bike touring. When hungry, stop and eat, sit in the dirt if need be. If we had waited five more kilometres we would have been at the river. It arrives suddenly, like a surprise. Despite our concerns earlier in the morning, we are at the next campsite by 12:15pm. Caked in dust and sweat the river is an idyllic sight - about 80m wide and a gorgeous deep green colour. It is fast flowing and the far bank has a big, sandy beach perfect for the large sunbaking saltwater crocodile we can see. All I want to do is dive in for a swim. We don't of course. Or, as one passing local suggests; if we do, only do it once. It is nerve-wracking enough having to refill all our water bottles from the boat ramp. One of us is on constant watch and we choose a different spot on the small concrete ramp each time. Then, another afternoon of heat and chasing shade begins. We lie on our tarp in the fine drifting dusty shade and chat to travellers as they drop by, sightseeing and fishing. A couple of tinnies motor past. We drink water, we chase the shade. We watch the massive saltwater crocodile cruise back downstream on dusk. At 5am the fruit bats are heading home to Kununurra. Wild patches of black shadow whirling in the dark sky. Some are in a hurry, heading straight and true, others crash into the tops of the gum trees to rest or feed on late blossom. By dawn they have disappeared. 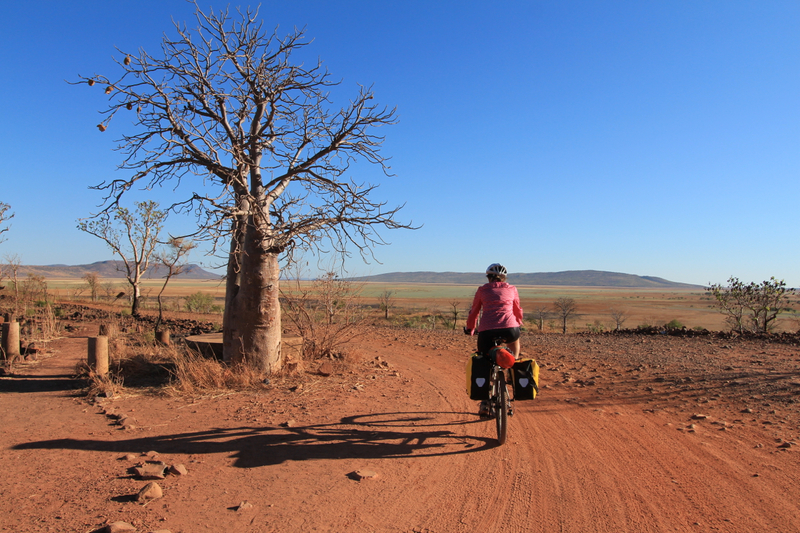 It is quiet except for the crunch of our tyres along the dirt road. Dust rises in a tiny rooster tail behind Caz's back wheel. Plains kanagaroos, dozens of them, pale and pretty, inhabit the roadside scrubland and dart here and there, flash across in front of us with their front paws held away from their bodies, ready to drop an inattentive cyclist. The Ord River haunts us on the left, glimpsed occasionally through the thick band of river gums and trees that line the bank. Fourth day fatigue has set in and my legs feel less sparky. The corrugations vibrate through the handlebars and my fingers are also aching from gripping things so tightly. 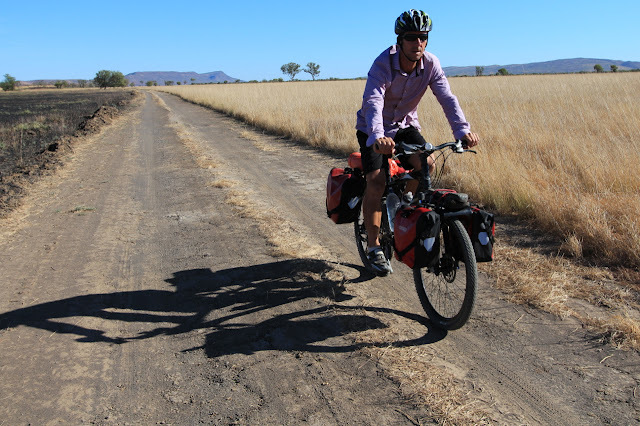 At least we are the best-dressed cycle tourers in the Kimberley, having purchased long sleeve Egyptian cotton shirts from Target just for the occasion. Cotton is the coolest fabric for this kind of heat and the shirts make us look like wealthy cow-cockies, out riding the fenceline. We stop for a break at another cattle grid and sit up on the metal railing to survey our land as it stretches away in all directions. There is a small range of hills looming and a road sign says 6km of winding road lies ahead. It is the most scenic part of the journey and a nice change from the open plains. There are lush gullies lined with pandani and the hills rise up sharply either side, cut with rocky scraps and ridges. Out the other side though, it is back to the long, flat straights. The hills are now off to our right but are broken by deep, rocky gorges. We pass a couple of turnoffs that head to hidden rockholes and wet season wonders - Black Rock Falls, Valentine Springs and Middle Springs. It is Sunday and lots of fast driving locals blast past heading out to the river. Our bike chains are squeaky with dust. We have a new dust-suntan; legs and face caked with the stuff. 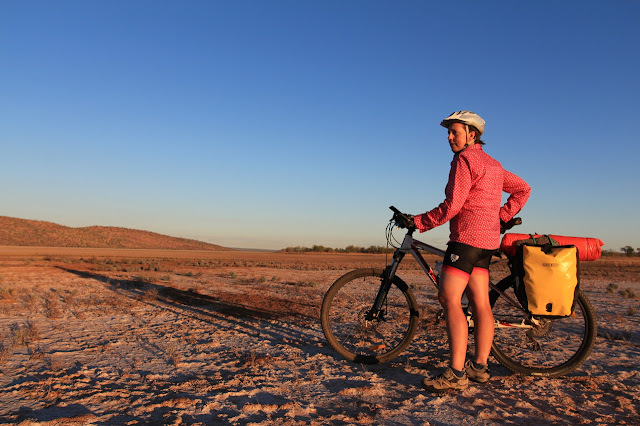 Mostly we have the road to ourselves and ahead Caz weaves around like an old drunk, searching for the best line between the corrugations and the sand. I find my own, similarlry erratic, route. 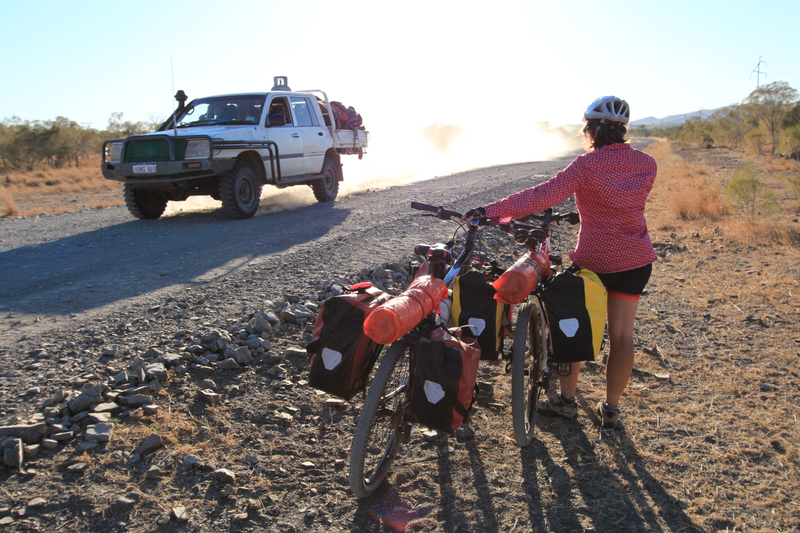 We hit the miracle of bitumen after two days and about 110km of dirt and it feels like gliding along ice. There's a good headwind of course but Caz loves a challenge. I tuck in behind and try to keep my cadence as high as his. At least there is a swim at the end. Protected from the salties, by a massive dam wall, we cool off in Lake Kununurra on the edge of town; scrub the dust from our shins and wash it from our matted hair and then tuck into our best cycle touring gift ever - a commercial tour group of American high school students at the caravan park in Kununurra give us a whole roast chook and a packet of mint slice biscuits as they are running late for their outward bound flight. This is seriously good booty. It's no golden-headed cisticola but the meat inspector would definitely approve. Ahh, excellent. A throughly enjoyable read. Wonderful light in the photos too. I'm entirely jealous! The Gibb River Road would be a sweet little trip too. Hi Phil, The good light in the photos is goes hand in hand with the very early starts on that trip! You may be also jealous of our plans for next week (to finish off our year of adventures) when we set off from Melbourne to cycle a torturous route north to Newcastle, via the Snowy Mountains. Might be writing Jens Voight's expression on our seat post - shut up legs! - when things get a bit tough. Always a pleasure catching up on your adventures guys! You are truly entrenched in adventure....well done on another great post.